On Tuesday 28th February, 2017 there were a number of English fixtures; especially in the lower leagues. I picked out five fixtures of interest and ended up with a profit of £110.35 (after Betfair commission) even though my 'banker' for the night went very wrong. A couple of goals the right way late on would have boosted my profit to around £350, but you'll never hear me complain about my trading bank getting bigger! When looking at multiple football matches, it's important to view them as just one big trade and adjust accordingly. As all successful football traders will tell you, avoiding losses is far more important than hitting winners so always have an eye on the bigger picture. As always, I carried out all of my research before any of the matches kicked off. As well as allowing me to concentrate fully when matches are in-play, it also ensures that I don't make any hasty - and emotional - decisions if things are going wrong. I will often allow myself one "off-piste" trade per session, but I didn't need anything tonight. It may have been 5th v 15th but MK Dons play well above their league position away from home. They were 7th in the away table, 2nd in the second half table away, 6th in the away form table, had the 7th best away attack, the top rated away defence and were top of the table away against top third teams. There was a lot to like, plus the fact that Bradford were playing below their 5th place at home in almost every category. At around 4.00 to back, the away win was very attractive. A bit of a relegation six pointer, 16th v 20th. Northampton had won their last three at home, had the 6th best home attack in the league and were 3rd against bottom third teams at home. Looking at Northampton home games and Oldham away games, 21/33 had gone 1-0 so I was confident of gaining a free bet. 15th v 12th, but Barnet were 8th in the away table. They were 19th in the first half table, but 1st in the second half table so I looked to take advantage of that. Barnet also had the 4th rated away attack which always boosts confidence as goals win games. 22nd v 18th and a real battle on the cards. Certainly a game that Hartlepool would see as a "must win" and they were 2nd in the first half table at home. Team Stats also showed me that 21/32 Hartlepool home games and Crewe away games had gone 1-0. 16th v 13th, but Sutton 8th in the home table and the first half table at home. They were also 5th in the home form table and 6th at home against middle third opposition. Being such a small league, the 'Next Goal' and 'Half-Time' markets were very low liquidity so I went with the main 'Match Odds' market instead. Of course, I don't need a home team to win in order to make a profit from a home win trade, I just need them to get in front at some point. We all know that compounding is very powerful; that is increasing stakes in line with bank size. For example, if you divide a £1,000 trading bank into 100pts and make 10pts profit each month - resetting the value of a point at the beginning of each month - after just three years your bank will be worth £30,000. 10pts per month... that's around 0.3pts per day. Just £3 profit from a £1,000 bank. Why doesn't everyone just do that? It's so simple when broken down! Well... most inexperienced traders are impatient and go for bigger wins. They are probably used to the adrenaline rush of gambling and treat football trading more as entertainment than a serious profit-making venture. Then there are many who reach their daily target but don't stop trading. As always, mindset and discipline will make or break you as a trader. With that small daily target in mind, I definitely didn't need to go in all guns blazing. I picked out Northampton Town v Oldham Athletic as my 'banker' for the night and built the other trades around it. Small profits here and there would chip away at a larger liability, should all go wrong. You will also notice that I spread my trades around the first half, second half and 90 minutes (home and away). They also vary in price, from 2.10 all the way up to 4.30. Just one 'true' first half trade - Hartlepool United v Crewe Alexandra. I originally intended to go for Hartlepool to score first, but there was no money in the 'Next Goal' market. Most games have a first half goal, so it follows that backing Hartlepool to win the first half is a similar trade. It is restricted, of course, to the first 45 minutes but the price is much higher. Swings and roundabouts. I backed Hartlepool to win the first half at 3.90 (£10) and set up a lay on the draw at 1.80 (£15). That was a total of £22 liability, but a nice green on the home win and small green on the away win should Crewe score. I also backed Hartlepool to score first at 2.30 (£10) though it wasn't matched even half an hour into the game. The 'Next Goal' market at Betfair suffers from poor liquidity in the smaller leagues. With my two 90' trades I backed Northampton to win at 2.22 (£50) and Sutton to win at 2.26 (£10). It was a much smaller amount at Sutton because of less liquidity in the market and the fact it was a National League game, so less consistent performances from teams. 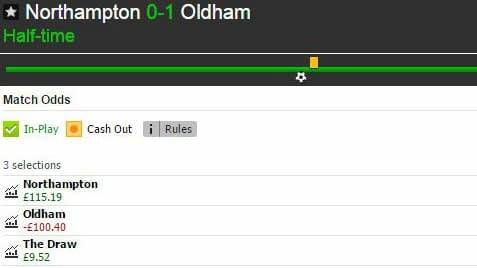 Oldham took the lead at Northampton on 23'. This was a surprise since Northampton had taken the lead in 11/16 home games and Oldham had fallen behind in 10/17 away. However, I had gone in with half the full stake I had allowed for the trade and that gave me something to work with. 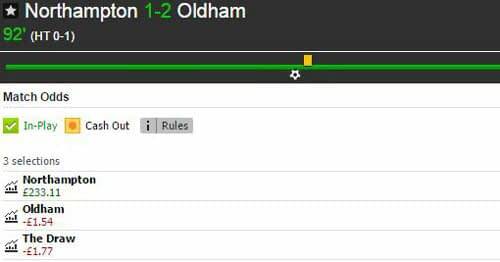 I layed Oldham at 1.84 (£60) which took my liability up to £100. Sutton took the lead on 31' and I immediately layed them at 1.25 (£10) so that it was now a no-lose bet. In the game at Bradford, it had gone 0-1 on 4' and then 1-1 on 22'. I decided to back MK Dons for £25 in a series of £5 bets as the price rose. However, only two of them were matched before the away team went back in front on 35'. Again, I layed to give myself a no-lose bet on the away win. Just as well too, with Bradford equalising for a second time on 43'. There had been plenty of corners and shots at Hartlepool, but it took until 45' for the home side to score. The 'Next Goal' back had also been matched, so a total of £54.27 profit in the pot. At half-time, I had a good profit already banked at Hartlepool and a couple of free bets at Sutton and Bradford. I could have locked in a profit at Sutton, but they were ahead 3-0 on corners and 11-3 on shots so I felt quite safe to leave it a while. My only concern at this point was Northampton, though they were leading the corner count 5-1 and the shot count 10-8. 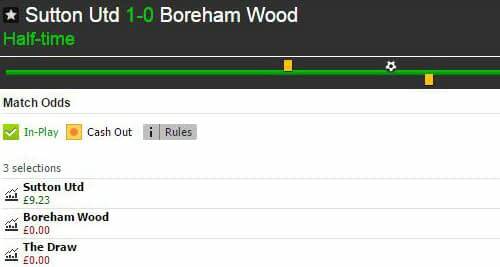 As long as they were able to equalise, I'd be able to lock in a profit for the evening. Northampton had won their last three at home and scored in 13/16 home games in total, while Oldham had only won one of their last six away and conceded in 13/17. It wasn't a bad position to be in. Barnet were already leading at Blackpool and went 0-2 up soon after half-time, so I couldn't get into that one. Reassuring that I had picked a strong trade though. Do I worry when I 'miss out' on 'winners'? Of course not, I concentrate on the trades I have running. I'd much rather wish I was in a trade than out of one, that's for sure! Bradford v MK Dons was looking pretty level from the in-play stats. An away goal would have been useful to hedge against my liability at Northampton, but it didn't come. Sutton continued to dominate their game but it remained 1-0, so I decided to lock in £7.64 profit around the 70' mark. That was a total of £61.91 profit locked in, but I needed Northampton to do something. The in-play stats at Sixfields were fairly level and on 75' I decided to lay Under 1.5 Goals at 1.95 (£52.50). This added £50 liability to my trade, but that was covered already by profit in the bank. I could have waited for a lower price to lay more, but I was fairly confident that the home side would start attacking more as time ran out and that would present scoring opportunities at both ends. Even another away goal would halve my liability and be enough - again treating everything as one big trade - to end up with a profit for the evening. An equaliser was much more likely though and it came on 84'. I was then able to lay the draw to remove all liability from the away win and guarantee my overall profit. I could have equalised the loss on the draw and away win, but laying more added to the home win - now a potential £210.87 and a goal for Northampton was far from impossible. I don't mind going a little aggressive in this situation; home team equalises fairly late, home fans get behind their team, away defence gets nervous, etc. Perhaps Northampton overcooked it a little though as it was Oldham who snatched a winner on 90+2' and a quick lay reduced my loss to virtually nothing in the Match Odds market. That made my £49.98 profit from the Over/Under 1.5 Goals market worth a lot more so, although I would have loved 2-1, I was still happy with the goal. Out of my five planned trades, I managed to get into four of them. Had I gone with set-and-forget bets I'd have hit two winners and two losers, but by trading I ended up with three profits and a scratch. I was a little disappointed that MK Dons took the lead twice and only ended with a draw, but they were underdogs and expected to lose. As soon as I banked the first half profit at Hartlepool, I had some green in the bank and knew my downside was far less than my potential profits. That gave me the confidence to be more aggressive at Northampton, which paid off nicely. With some experience and patience, football trading is incredibly profitable. Our exclusive Team Stats software does most of the work, making research very quick indeed. I spent no more than 15 minutes picking out these five trades this evening. I had my trading plan written down, put a movie on and ended the evening more than £100 better off. Now to spend 15 minutes researching tomorrow's fixtures!